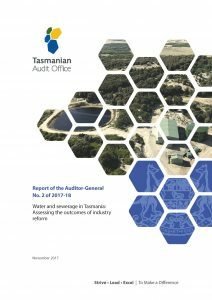 The report ‘Water and Sewerage in Tasmania: Assessing the outcomes of industry reform’ is an audit on the benefits derived from the structural changes made to the Tasmanian water and sewerage industry since 2009. The objective of the audit was to form conclusions on the extent to which the intended outcomes arising from the reforms of the water and sewerage industry have been achieved. The audit examined the performance of the regulated entities responsible for the provision of water and sewerage services before and after the commencement of the Water and Sewerage Corporations Act 2008 (the 2008 Act) and the Water and Sewerage Corporation Act 2012 (the 2012 Act). Throughout this report, the structural, economic and regulatory changes to the water and sewerage industry initiated by these Acts, together with the Water and Sewerage Industry Act 2008 (2008 Industry Act) and the Water and Sewerage Industry Amendment Act 2012 (2012 Industry Act) are referred to as the ‘reforms’. Implementation of the 2008 reforms commenced from 1 July 2009 and implementation of the 2012 reforms commenced from 1 July 2013. The audit commenced in October 2016 and examined information and data that was available up to and including the 2015-16 financial year. For currency and fairness, the scope of the audit has included 2016-17 information and data where appropriate. Where 2016-17 data is reviewed, amended (if required) and published according to a regulatory requirement by organisations such as the Department of Health and Human Services (DHHS) and the Office of the Tasmanian Economic Regulator (TER), I have chosen not to pre-empt their official reports by including that data in this report. Both DHHS and TER reports relevant to the water and sewerage industry for 2016-17 are due in the first quarter of 2018. However, commentary in respect of 2016-17 has been included where appropriate. An examination of dams was not included in the scope of this audit as dams were not specifically mentioned in the intended outcomes of the reforms envisaged by the government.